Get an e-mail notification as soon as a new article is posted. Unsubscribe at any time. How do I Develop a Sample Prep Method? How do I come up with a “starting point” for my SPE method? How does my sample prep change between GC/MS and LC/MS/MS? Troubleshooting Loss of Signal: Where did my peaks go? This is a question that I am often asked by very smart people that just haven’t had time to learn the process. An optimized sample preparation method is critical for an accurate, specific, robust clinical LC-MS/MS assay. Once the LC and MS/MS conditions for the compounds of interest are optimized, and method parameters like desired LOQ/LOD, analytical measurement range and specimen volume used for analysis have been established, sample prep method development can begin. A good sample prep method can improve accuracy and precision, provide longer LC column lifetime, and keep your LC-MS/MS system clean. Continue reading How do I Develop a Sample Prep Method? Posted on April 11, 2019 Author Stephanie MarinLeave a comment on How do I Develop a Sample Prep Method? You’ve just decided to develop a solid phase extraction (SPE) method for a new assay in your laboratory. However, there are so many decisions to be made! Which company do I choose? Which product do I use? Polymer based sorbent or silica based? Cation or anion exchange? While this seems incredibly difficult, it doesn’t have to be that hard! Today, we’re going to walk through this process of figuring out how to develop a starting point for our SPE method. Continue reading How do I come up with a “starting point” for my SPE method? Posted on November 1, 2018 Author Jillian NeifeldLeave a comment on How do I come up with a “starting point” for my SPE method? LC/MS/MS seems to be the new gold standard in sample analysis nowadays. However, some labs (like forensic labs) are a little slower to get LC/MS/MS instruments and are still analyzing samples using GC/MS. The majority of published articles in peer-reviewed journals are for LC/MS/MS so those working in laboratories with GC/MS instrumentation may not know how to change the sample preparation to better fit GC/MS. First and foremost, GC/MS methods tend to need a higher sample volume than LC/MS/MS methods. GC/MS is a less sensitive instrument, which means more sample is needed to achieve lower limits of quantitation (LOQs). Many LC/MS/MS methods only require 50-200 uL of sample. GC/MS methods usually require 1-3 mL of sample. Because of the higher sample volume needed for GC/MS analysis, higher mass sorbent beds in the extraction cartridge are usually needed as well. The larger sorbent bed allows for a higher amount of the compounds of interest to bind to the sorbent bed. Because of the larger sorbent bed, higher volumes of wash solvent and elution solvent are needed as well. GC/MS also can’t be used for super volatile compounds because of the temperature of the injection port. For many methods, the injection port can be anywhere from 150⁰C to 300⁰C. Many compounds can’t hold up to these temperatures. Because of this, derivatization becomes necessary for many compounds when analyzing by GC/MS. Very simply, derivatization involves adding a structure onto your compound of interest that acts as a stabilizer. This adds time to your sample preparation as an incubation period is necessary in order to make sure that the compounds in your sample are fully derivatized. When reconstituting samples for LC/MS/MS analysis after the extraction and dry down are completed, the mobile phase starting conditions are usually used as a reconstitution solvent. For example, if the LC gradient in a method starts as 90% aqueous mobile phase A and 10% organic mobile phase B, the reconstitution solvent would be that same 90:10 mix. In GC/MS analysis, the reconstitution solvent needs to be 100% organic, usually ethyl acetate or acetonitrile. The reconstitution volume is usually much lower in GC/MS than in LC/MS/MS. Since GC/MS is a less sensitive instrument, the less solvent used to reconstitute the sample, the more concentrated the compounds are as they are injected into the GC/MS. These are some of the biggest differences between sample preparation methods for GC/MS and LC/MS/MS analysis. As can be seen above, the differences between methods are minimal, which makes it a fairly simple process to develop a new method for one or the other instrument type. If any questions come up during this process, reach out and ask us! Posted on June 27, 2018 Author Jillian NeifeldLeave a comment on How does my sample prep change between GC/MS and LC/MS/MS? Most clinical and forensic labs have a used a traditional approach for drug testing called screen with reflex to confirmation. This involves analyzing specimens (urine, blood, other body fluids, and solids like tissue and meconium) using an immunoassay technique that identifies a drug class. Positive immunoassay results are then analyzed by second, more specific method like GC-MS or LC-MS/MS to identify and quantitate specific drug analytes. A quantitative result is reported. Last time we wrapped up tuning our analytes to the mass spectrometers optics. However, let’s take a break from that and have a look at one of the more irritating issues in LC/MS method development: signal loss. I’m not talking about signal attenuation, which can be much more convoluted to diagnose; but rather a complete loss of signal – nothing, not even a blip on your TIC. So where do we begin? Continue reading Troubleshooting Loss of Signal: Where did my peaks go? Posted on April 3, 2018 Author Dan MenascoLeave a comment on Troubleshooting Loss of Signal: Where did my peaks go? When should I choose SPE instead of SLE? 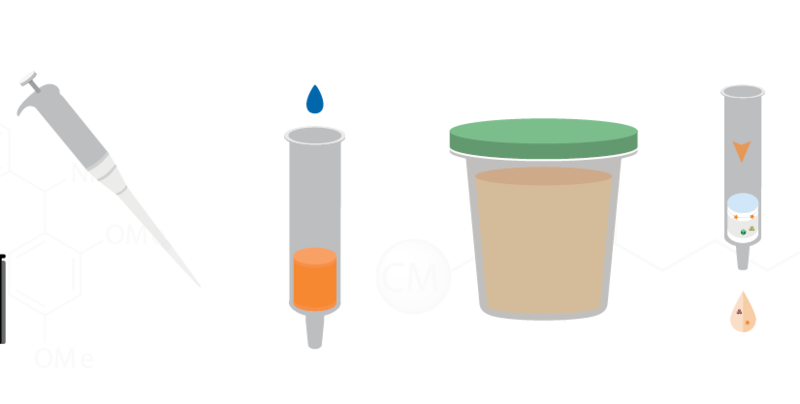 Supported liquid extraction is a simple, yet effective sample preparation technique. It works like liquid-liquid extraction (LLE) but is supported on a solid surface. Aqueous samples are dispersed as small droplets on a high surface area material. The entire sample remains on the SLE column. Samples are eluted with a water-immiscible solvent, like ethyl acetate, hexane, or dichloromethane. The compounds of interest partition into the organic phase, like an LLE, while salts, phospholipids and other impurities remain on the column. The simple load, wait, elute protocol is fast and easy and provides excellent sample cleanup that can be automated. Solid phase extraction is more involved. Samples are loaded onto a SPE column, and the sample flows through and is discarded. Analytes of interest (and some undesirable compounds) are retained by hydrophobic interaction or ion exchange. The column is washed with aqueous and organic wash solvents to remove interfering compounds. Then, the analytes of interest are eluted based on their retention mechanism. Organic solvent is used for hydrophobic compounds, acid or base for ionized compounds. Continue reading When should I choose SPE instead of SLE? Posted on February 15, 2018 March 28, 2018 Author Stephanie MarinLeave a comment on When should I choose SPE instead of SLE? Putting it Together: why should I tune my mass spectrometer? Previously, I spoke about how to focus our mass spectrometer’s source to maximize our analytes signal. We were interested in the detection of naloxone, buprenorphine, norfentanyl, and methadone in urine and determining their source parameters, but for this post, we’ll discuss the process behind tuning our analytes to the mass spectrometer’s optics. Continue reading Putting it Together: why should I tune my mass spectrometer? Posted on January 16, 2018 Author Dan MenascoLeave a comment on Putting it Together: why should I tune my mass spectrometer? Why should I choose a protein precipitation 96-well plate for my method instead of doing a traditional protein crash? Most clinical chemists have developed a blood, serum or plasma assay using a protein crash because it is inexpensive and generally removes proteins that interfere with detection or the analysis in some way. This is usually done by adding a “crash” solvent like methanol or acetonitrile to the blood sample, vortex mixing, then centrifuging and removing the supernatant to remove the crashed proteins from the sample. Sometimes the crash solvent is acidified to aid solubility and begin the denaturation process. The crash solvent is usually added at a ratio of 3:1, but can sometimes require up to 10:1 solvent:specimen. For more information on the process of doing a protein crash I recommend this article. Continue reading Why should I choose a protein precipitation 96-well plate for my method instead of doing a traditional protein crash? Posted on December 5, 2017 December 11, 2017 Author Stephanie MarinLeave a comment on Why should I choose a protein precipitation 96-well plate for my method instead of doing a traditional protein crash? In-well hydrolysis plates: Do they really work? In-well hydrolysis means hydrolyzing urine samples in the well of the extraction plate instead of outside of the extraction plate (I talked about why we hydrolyze in this blog post). This can be a time saver for high throughput labs, which makes it look very appealing. In this blog post, I will be discussing some of the advantages of using an in-well hydrolysis plate and some of the results that I’ve gotten when compared to an out-of-well hydrolysis plate. Continue reading In-well hydrolysis plates: Do they really work? Posted on October 10, 2017 Author Jillian NeifeldLeave a comment on In-well hydrolysis plates: Do they really work? Putting it together: what are the first steps to building a proper method? Last time, I discussed how to gather information from the literature that would best suit our application for the detection of naloxone, buprenorphine, norfentanyl, and methadone in urine. Let’s quickly recap: we have our matrix and our analytes and a Shimadzu NexeraX2 LC with a 5500 Sciex MS. We did some searching and eventually settled on a poster we found on the Biotage website titled “Sample Preparation Strategies for Urine Panels with 50 or More Drugs and Metabolites Analyzed by LC-MS/MS.” Now what? Continue reading Putting it together: what are the first steps to building a proper method? Posted on September 27, 2017 October 6, 2017 Author Dan MenascoLeave a comment on Putting it together: what are the first steps to building a proper method?